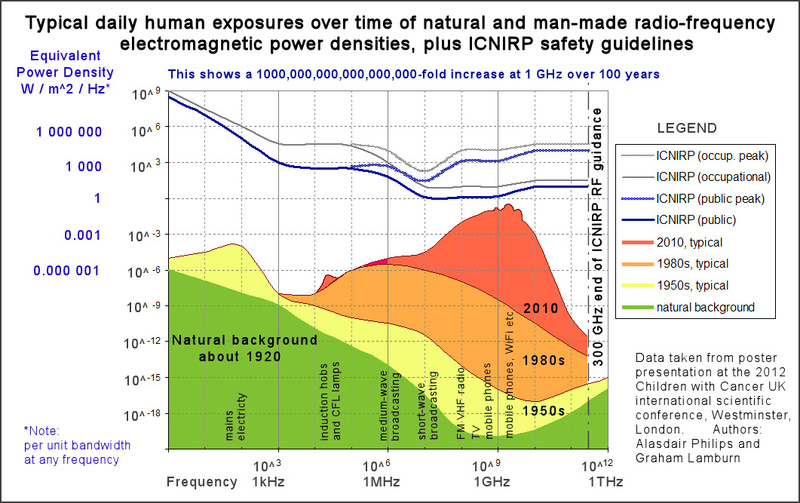 As reported by electrical engineer Alasdair Phillips in a 2012 conference, the background levels of microwave radiation in cities are now a quintillion (10 to the 18th) times higher than the levels of “electrosmog” our ancestors were ever exposed to. No, our EMF environment is definitely not Paleo. We’re all being over-exposed, 24/7. And just like most people don’t feel the benefits of an organic, real food diet until they actually try it for several days straight; most people do not start feeling the benefits of a low-EMF environment until they go camping in nature or dramatically reduce their exposure inside the home. Dr. Dietrich Klinghardt, MD, Ph.D. is recognized as one of the pioneers in the management of the hardest cases of chronic neurological and infectious diseases in the world. “I can pretty much divide my patient population in the middle: the group that gets better, and the group that won’t budge or is getting worse. Several years back, Klinghardt wanted to verify his theory that a low-EMF environment could support his patients’ recovery from chronic disease and improve their body’s innate healing abilities. He flew several patients from all around to world to a remote location in Brazil considered a nearly “radio silence” zone — where levels of electrosmog are close to our ancestral levels. “Usually within 5-7 days [in this extremely low-EMF environment], even the ALS patients we had were completely asymptomatic. As a doctor focused on clinical results over mere theory, Klinghardt didn’t wait around for “more studies to come out”. He now refuses to treat patients unless they follow a stringent EMF-reduction protocol including the removal of wifi from the home, minimal cell phone use, and the use of a Faraday cage bed canopy or applying shielding paint in the bedroom — both of which try to mimic the ancestral EMF environment our biology is naturally accustomed to. Will Reduction of Electrosmog Become An Integral Part In The Treatment of Autoimmunity? Similar benefits as those observed by Dr. Klinghardt in the story above have been seen in dozens of patients suffering from a wide array of autoimmune and neurological diseases, such as arthritis, lupus, multiple sclerosis, sjogrens, and celiac. Considering that Prof. Marshall has demonstrated that electrosmog can suppress the immune system as much as taking NSAIDs (in mice), it makes sense to reduce our exposure as much as we can while more studies are being done. EMF-aware health practitioners around the world are reporting cases of how certain wireless or electrical devices are causing symptoms in their patients, but because governmental authorities still do not believe EMFs can possibly cause health issues, these cases mainly go unreported. In one case, a defective electric toothbrush which produced tremendous levels of magnetic fields caused a 66-year old woman to feel bouts of headaches and dizziness. A few weeks after discontinuing the use of this toothbrush, her symptoms vanished. “A 51-year-old man in generally good health complained of chronic difficulty with insomnia. Although he experienced no problem falling asleep, for the last 17 years he had routinely awoken at about 2:30 a.m after 4 h of slumber and was consistently unable to return to sleep. After the physician assessed this man’s EMF environment using a “Microsurge meter” which detects levels of a type of EMF called dirty electricity (electricity fluctuations on household wiring), he confirmed the levels were off the charts — reaching as much as 1600 GS units, while safe levels are usually 30 GS units or lower. Other sources of EMFs which have been demonstrated — clinically and in several peer-reviewed papers — to induce EMF-related symptoms include cell phones, tablets, Bluetooth devices, wifi routers, cell phone towers, electric or hybrid cars, and many more. “Smart” wireless utility meters have also been shown to be highly problematic, and several physicians have seen reports of headaches, insomnia, tinnitus, fatigue, and various other symptoms upon their installation — even in people who had never considered themselves “EMF-sensitive” in the past. There are several easy ways you can reduce your EMF exposure, and most of them do not require a huge investment in money or time. Most health practitioners these days are unfortunately not aware of these EMF dangers or know how to identify EMF-related symptoms. In collaboration with Dr. Klinghardt and independent scientists, Investigative Health Journalist Nick Pineault (the author of this article) has developed a brand new guide which contains the foundational EMF knowledge every health practitioner in the world needs to know. It’s called “How EMFs Affect Your Patients”, and you can download it for free at this link. If you’re not a health practitioner, please spread the word to any doctors, nurses, nutritionists, acupuncturists, health coaches or personal trainers in your circles. Nick is on a mission to fix this important knowledge gap in functional medicine and we invite all Health Nut News readers to support him! Is this bathroom staple dangerous?